After a long time, Our team finalized to enjoy a weekend. (Some couldn't come at the eleventh hour due to their personal reasons), but we managed to execute our plan successfully. Thanks to Shaju and all enthusiastic people for travel like me. 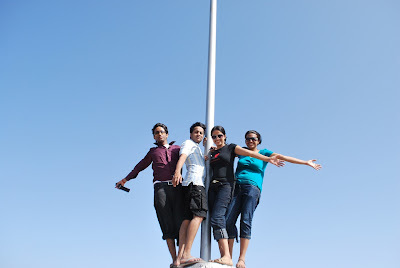 We decided to go to Kashid Beach and Murud Janjira Fort and prepare the plan one day back. We started early in the morning approx 6 a.m. Murud Janjira is approx 200 KM away from Pune. We followed via Mumbai Pune Expressway - Khopoli - Pen - Alibaug - Kashid - Murud. Our first stop was the breakfast point at Mumbai Pune expressway, where we have a little breakfast, which two of us (including me) puked out near Alibaug. After that, we reached Kashid beach as per our execution plan. 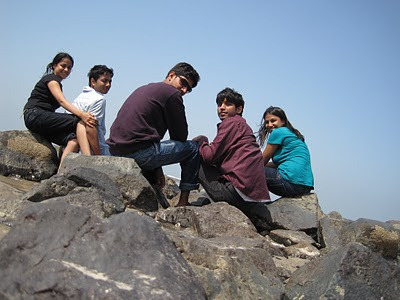 Kashid is a small place but attracts the people residing in Mumbai, Pune and nearby regions for weekend vacations. Kashid is famous for its white sand, blue seas, green mountains (greener during monsoon), rivulets (small river) and paddy fields. 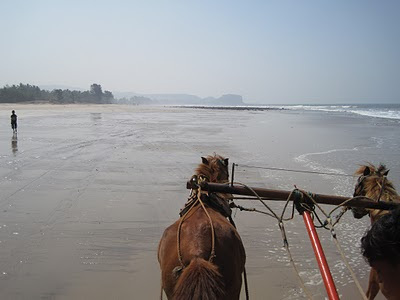 We enjoyed some time under the sun, have the horse-cart ride near the sea. Having one friend (Zabi) knowing Marathi was beneficial throughout our tour. 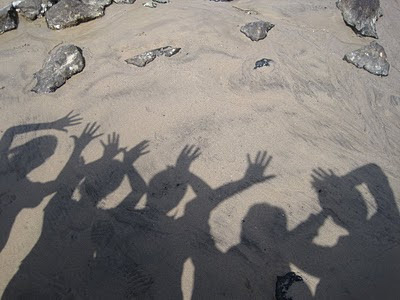 Some of us scrabble their names in the sand with effects :) After that we move forward to Murud area, that is approx 20 KM away, which have good hotels and has many good places for sea food lovers in this region. We have our lunch there, that was satisfying. In the way, We viewd (Kasa Fort and Murud Janjira Fort). The view covering the beach and the fort in the sea is eye catching. Janjira fort was our next spot. 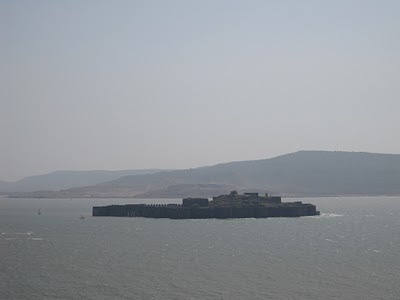 Murud Janjira Fort: It is beautifully constructed in the sea (not beautiful now as most of the area is converted to ruins), but still it is worth to watch. The name may have derived from the Arabic word Jazeera (meaning 'an island'). 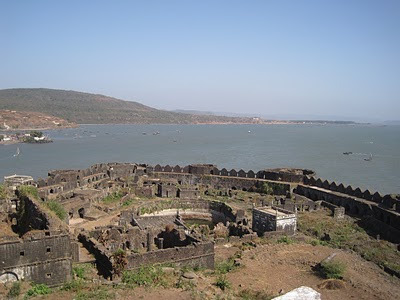 Some people also named it as "JAL JEERA" (Fort in the water). You have to go through sail-boats to reach this fort. I wouldn't be inking more about the history of this fort. We reached here when the sun was just above our head. This was the most hilarious part of the day, when we were boating towards the fort from the beach, as the high tides bring water three times inside the boat. You can see the thrill behind the specs of Shaju, Anjali and Shweta holding their nerve and the tightly hands being almost at the end of the boat. The entrace is not visible till the time you reach in front of the entry stairs of this fort. 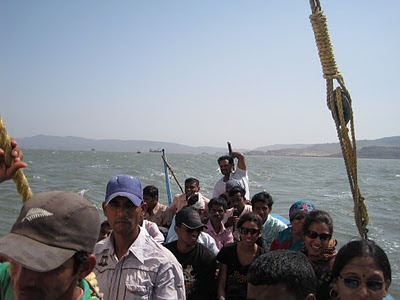 While being on the boat, it reminds the song "Ye Jo Desh Hai Mera" from SRK acted "Swadesh". I captured some video with this song in its background. The sailer sails the boat technically using the wind direction and boat-curtain applying boat balance at the same time. The entrance fee is 20 INR (Including to and fro ferry ride). The guide fee is 30 INR (per person.. also depends on, How many people are in your group to get the discount) Though they wouldn't narrate much, but the benefit you will get with them is to cover most of the part within that time span. They also said, If you are not in the same returning boat (or missed that), you have to give them 800 INR to get on the other boat. Other than that, the fort has 4 mosques and 1 temple in it. At the middle of the fort, there is sweet water (I would say soft water) that is strange in itself as the fort is build in the sea area [No need to mention sea water being salty]. The guide told us that there is an underground natural spring (Water fountain) below the sea level. From the top of the fort, You can see every part of the fort. At this point, wind keep on chatting with you, but you will like it even being it hot. From this fort, you can watch another fort (Padamdurg Fort, now known as Kasa Fort), that is not accessible to general public and requires special permission from the Navy. In the rainy season, The fort remains close (mainly June-Sep mid), as the sea level increases, and there are much higher tides. 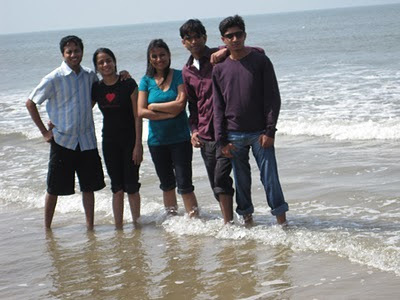 Again we returned to the Kashid beach to have some sea-sports and enjoyed till the sunset. For the time being we have a cup of tea and relaxed here. 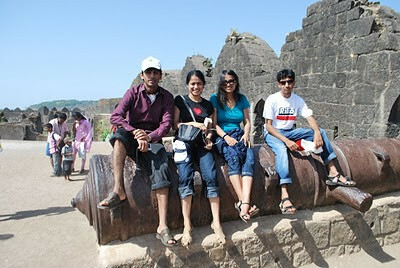 Wanna to have a look to another Fort nearby Pune-Mumbai "The Lion Fort"
Enjoy the nearby places and beaches at Alibaag. Love your post as i myself enjoyed kashid a lot. One simple happiness,nba jersey a worldly will grow old. Keep a young heart, do a simple people, enjoy sunshine and warmth. Nobody can go back and start a new beginning, but anyone can start now and make a new ending.Life should be so.John Elway JerseyAll the art of living lies in a fine mingling of letting go and holding on. physical activity is any Cheap Steelers Jerseys form movement that causes your body to use enegy. it may be purposeful. such as when you exercise or play sports. it may also occur as part of your regular routine, for example,as you are walking or riding bike to go to school,Aaron Smith Jersey you are doing the physical activity. many forms of physical activity can improve your physical fitness, the ability to carry out daily tasks easily and have enough reserve energy to respond to unexpected demands. maintaining a high level of physical fitness gives you a sense of Ben Roethlisberger Jersey total well-being and is an important lifelong health goal.Sports help to keep people healthy and more energetic. Hi dear what a journey in your young life so forever remember this point, I see the your pictures so nice and great view .....Naveedee karachi Pakistan.